Road teams did well in the second week of MLS play but by holding serve at home – in front of a small crowd – Columbus held first place in Soccer America's MLS Power Rankings. 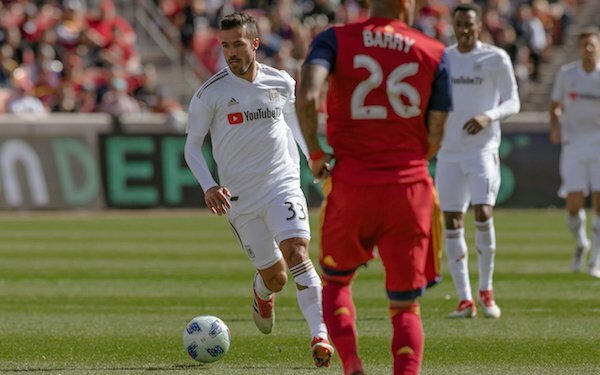 Both New York teams won at home to take the next two spots and a spectacular road victory by Los Angeles FC moved the expansion team up to fourth. Vancouver and Sporting Kansas City also won away to solidify spots in the top tier. Four of nine games were won by the road teams. Only MLS results are factored into the Power Rankings, which include a team’s record in parentheses and rank last week. 1. COLUMBUS (2-0-0), 1. On the field, Crew SC has five goals and six points. In the stands for the home opener: 11,098. 3. NY RED BULLS (2-0-0), 4. Story of the day was teenage debutant and goalscorer Ben Mines, but in just one game for NYRB Carlos Rivas equaled his goal total (2) in his first 42 games for Orlando City. 4. LOS ANGELES FC (2-0-0), 5. Second game in the team’s existenceand it sets a goalscoring record in Rio Tinto? Yowza. Real deal here, folks. 5. VANCOUVER (2-0-0), 6. ‘Caps won six road games last year (only TFC won more) and did it again: a few key saves from Stefan Marinovic preserved a 2-1 lead in Houston. 6. HOUSTON (1-1-0), 2. The Dynamo battled back to tie it up and couldn’t catch up again after falling behind early in the second half. 7. PHILADELPHIA (1-0-0), 7. Philly gets a good measuring stick this weekend when Crew SC comes to town. 8. ATLANTA UNITED (1-1-0), 8. Another game, another record – stand-alone crowd for MLS game (72,035) -- and another goal and assist for Miguel Almiron. A 3-5-2 formation with Jeff Larentowicz as defensive keystone gives foes something new to ponder. Photo courtesy of Atlanta United. 10. LA GALAXY (1-1-0), 9. When an attacking DP is subbed at halftime with the score 0-2, something is amiss. Giovani dos Santos, to wit. 11. SPORTING KC (1-1-0), 19. Newcomers lit up the scoresheet -- Felipe Gutierrez (two goals), Johnny Russell (goal, assist) -- and SKC regained lead after scoring first two goals and conceding three. 12. TORONTO FC (0-1-0), 14. After Tigres on Tuesday, it’s on to Montreal for the Impact’s home opener. Very tough week. 13. CHICAGO (0-1-0), 7. Three goals -- two by Nemanja Nikolic -- in 12 minutes wipes out 2-0 deficit. Then the Fire concedes twice in four minutes to lose. Also a concern is the crowd of 14,021. 14. MINNESOTA UNITED (1-1-0), 21. Crushing blow to lose Kevin Molino to a torn ACL. Now comes a big test for the squad and sporting director Manny Lagos. 15. NEW ENGLAND (1-1-0), 22. Goals for Chris Tierney and Diego Fagundez, penalty-kick save for Matt Turner, first MLS win for head coach Brad Friedel. And no spot for Lee Nguyen. 16. SEATTLE (0-1-0), 16. Rotation and depth come into play again with games in Guadalajara and Frisco. 17. REAL SALT LAKE (0-1-1), 11. Even if Justen Glad is the future, is David Horst the present? Some fight in midfield would also be nice. 18. ORLANDO CITY (0-1-1), 12. Summing up: that’s one point in two home games against teams that missed the 2017 playoffs. 19. FC DALLAS (0-1-0), 18. FCD is at home Saturday against fatigued Sounders. Can it take advantage? And what if it can't? 20. D.C. UNITED (0-1-1), 17. Being blown out in the Benz is not as important as what happens this weekend in the “home” opener at Maryland SoccerPlex against Houston. 21. PORTLAND (0-2-0), 13. Struggles without Diego Chara are nothing new but too many starters were not tuned in. This was Red Bull New York, not Red Bull Leipzig. 22. MONTREAL (0-2-0), 20. After equalizing, Raheem Edwards committed the foul that gave away the late PK that decided the game. There are some promising signs – and defensive questions -- for the Impact heading into home opener this weekend. 23. COLORADO (0-1-0), 23. Off the bench in his pro debut Niki Jackson scored a late goal. On the road, Rapids lost on a deflected free kick in stoppage time. Not bad.